Here we bring you the latest syllabus for CBSE Class 9 Science. Students may download the complete syllabus in PDF. Going through this syllabus will help you know the complete list of topics to be studied and other learning activities to excel in the Science subject. 1. There will be an Annual examination based on entire syllabus. 2. The annual examination will be of 80 marks and 20 marks shall be for Internal Assessment. For 5 marks- Three periodic tests conducted by the school. Average of the best two tests to be taken. This will have a weightage of 05 marks towards the final result. For 5 marks- Diverse methods of assessment as per the need of the class dynamics and curriculum transaction. These may include- short tests, oral test, quiz, concept map, etc. This will also have a weightage of 05 marks towards the final result. b. Practical / Laboratory work should be done throughout the year and the student should maintain record of the same. Practical Assessment should be continuous. There will be weightage of 5 marks towards the final result. All practicals listed in the syllabus must be completed. c. Portfolio to be prepared by the student- This would include classwork, other sample of student work, self-assessment and peer-assessment. This will carry a weightage of 5 marks towards the final results. So, before starting with the new session, students should know the latest CBSE syllabus so that they may prepare a right plan to study the course properly. Nature of matter: Elements, compounds and mixtures. Heterogeneous and homogenous mixtures, colloids and suspensions. Particle nature, basic units: Atoms and molecules, Law of constant proportions, Atomic and molecular masses. Mole concept: Relationship of mole to mass of theparticles and numbers. Structure of atoms: Electrons, protons and neutrons, valency, chemical formula of common compounds. Isotopes and Isobars. Cell - Basic Unit of life: Cell as a basic unit of life; prokaryotic and eukaryotic cells, multicellular organisms; cell membrane and cell wall, cell organelles and cell inclusions; chloroplast, mitochondria, vacuoles, endoplasmic reticulum, Golgi apparatus; nucleus, chromosomes - basic structure, number. Biological Diversity: Diversity of plants and animals - basic issues in scientific naming, basis of classification. Hierarchy of categories / groups, Major groups of plants (salient features) (Bacteria, Thallophyta, Bryophyta, Pteridophyta, Gymnosperms and Angiosperms). Major groups of animals (salient features) (Nonchordates upto phyla and chordates upto classes). Health and Diseases: Health and its failure. Infectious and Non-infectious diseases, their causes and manifestation. Diseases caused by microbes (Virus, Bacteria and Protozoans) and their prevention; Principles of treatment and prevention. Pulse Polio programmes. Motion: Distance and displacement, velocity; uniform and non-uniform motion along a staight line; acceleration, distance-time and velocity-time graphs for uniform motion and uniformly accelerated motion, derivation of equations of motion by graphical method; elementary idea of uniform circular motion. Force and Newton’s laws: Force and Motion, Newton’s Laws of Motion, Action and reaction forces, Inertia of a body, Inertia and mass, Momentum, Force and Acceleration. Elementary idea of conservation of Momentum. Gravitation: Gravitation; Universal Law of Gravitation, Force of Gravitation of the earth (gravity), Acceleration due to Gravity; Mass and Weight; Free fall. Floatation: Thrust and Pressure. Archimedes’ Principle; Buoyancy; ElementaryIdea of Relative Density. Work, energy and power: Work done by a Force, Energy, Power; Kinetic andPotential energy; Law of conservation of energy. Sound: Nature of sound and its propagation in various media, speed of sound, range of hearing in humans; ultrasound; reflection of sound; echo and SONAR. Structure of the Human Ear (Auditory aspect only). Physical resources: Air, Water, Soil. Air for respiration, for combustion, for moderating temperatures; movements of air and its role in bringing rains across India. Air, Water and Soil pollution (brief introduction). Holes in ozone layer and the probable damages. Bio-geo chemical cycles in nature: Water, Oxygen, Carbon and Nitrogen. 3. Separation of the components of a mixture of sand, common salt and ammonium chloride (or camphor). (e) Sodium sulphate with barium chloride in the form of their solutions in water. 5. Preparation of stained temporary mounts of (a) onion peel, (b) human cheek cells & to record observations and draw their labeled diagrams. 6. Identification of Parenchyma, Collenchyma and Sclerenchyma tissues in plants, striped, smooth and cardiac muscle fibers and nerve cells in animals from prepared slides. Drawing of their labeled diagrams. 7. Determination of the melting point of ice and the boiling point of water. 8. Verification of the Laws of reflection of sound. 9. Determination of the density of solid (denser than water) by using a spring balance and a measuring cylinder. (b) Strongly salty water, with the weight of water displaced by it by taking at least two different solids. 11. Determination of the speed of a pulse propagated through a stretched string /slinky. 12. Study of the characteristics of Spirogyra / Agaricus, Moss / Fern, Pinus (either with male or female cone) and an Angiospermic plant. Drawing and providing two identifying features of the groups they belong to. (a) One specific feature of its phylum. (b) One adaptive feature with reference to its habitat. 14. Verification of the law of conservation of mass in a chemical reaction. 15. Study of the external features of root, stem, leaf and flower of monocot and dicot plants. 1. Question paper will consist of 27 questions. 2. All questions would be compulsory. 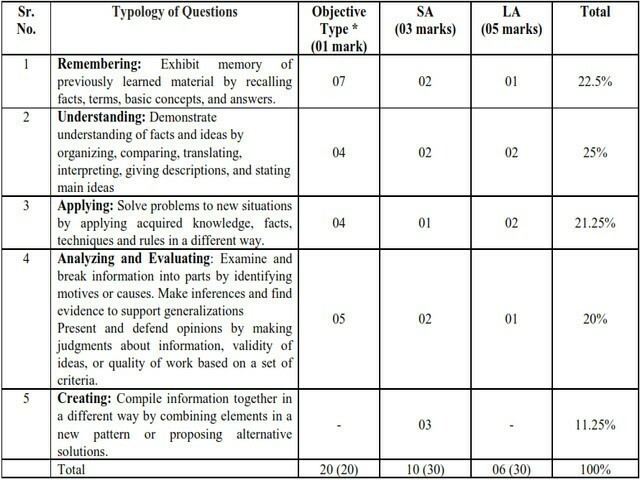 However, an internal choice will be provided in two questions of 3 marks each and one question of five marks. *One question of 3 marks will be included to assess the values inherent in the texts.